Co-authored by Andrea Monasterios, a Bolivian journalist. On September 23rd of 1995 Lili died and was born as Feliza, her real name. She left behind an identity that wouldn't belong to her any longer and was forced to start a new life. Days before, a clairvoyant read her hands and closed them without wanting to tell her what destiny had planned for her. "What did you see? Am I'm going to die? Is it an accident?" She asked half jokingly but half serious to the clairvoyant. Little did she know that she was guessing her future. Feliza in the 300-mile trip by wheelchair through the Andes Mountains to the capital La Paz. Fidelia Feliza Ali Ramos, was born in 1970 in Rio Grande an isolated little town, two and half hours from the Uyuni salt flats in Bolivia where the train only goes once a week. It didn't take long for her family to move to Uyuni to settle and bring up their eight children. Feliza's dad dropped out of school at the age of 10, while her mother only went to school for two years. Feliza's mum, was adopted because her family was too poor to look after her. Her new family exploited her and didn't let her fulfill her dream of becoming a teacher, so she promised herself that her daughters would study. Although she spent her childhood helping her mum sell food, a job she hated, Feliza knew she didn't want to sell things to make a living. "I understood everything very fast" explains Feliza, but one thing she never understood was why her mother was always angry at her father. She was 18 when she caught her dad with another woman. She then stopped judging her mother. Feliza's dad couldn't see a future for his daughters; he believed girls were made for the kitchen. Her mum, on the other hand, kept her promise and helped her six girls through university, defying all the odds in a very macho society. She moved to Potosi, to study social work at university, a new career that had just opened. After a while her passion wore off and she wanted to drop out of university. However, every week her mum sent parcels filled with fruits and chopped vegetables; it was her mum's love that kept her going until she finished her degree. At university she discovered her passion for leadership and she became the president of the student union. "I'm only realizing now, I was courageous since I was a little girl," says Feliza, while smiling, "I was always the best in my class..."
Two days after graduating, she'd already found a job at a local mine, the payment was good but she was bored and wanted to continue her education. Feliza was inspired by one of her teachers, Miriam Gamboa, "She was the best, she argued with all the men at big events and didn't let anyone put her down, I wanted to study overseas like her, that was my goal," remembers Feliza while her thoughts drift off into the past. Feliza arriving in Japan, 2011. The chain of events leading up to the bus accident on September 23rd 1995 began when Erli, Feliza's boyfriend of five years, asked her to go and live with him in Potosi. She went to Tupiza a town near Potosi, to attend a conference about Che Guevara, but when she arrived, it wasn't on. Erli had asked her to stay longer, but she wanted to go back to Uyuni. She bought her bus ticket and when she got to her seat, it was occupied. She went back to the ticket office and the girl told her, "the bus is empty, you'll be more comfortable in another seat." So Feliza agreed and went to buy a drink, when she looked back the bus was leaving. Feliza always wears high heals because she's so short and she couldn't run after the bus, it was Erli who managed to stop the bus, not knowing that Feliza was about to embark on the most tragic trip of her life. Once on the bus, Feliza was reading a story about a woman who'd lost all mobility of her body, anguished by the story, she fell asleep holding the book. The next thing she heard were people screaming, the abrupt movement of the bus was uncontrollable. The windows smashed and her beautiful long hair tangled with rocks on the road, "I had to rip my hair from of my head to get free." Feliza was thrown from the bus and landed on her head, the only thing she could feel was blood on her chin, she couldn't move her legs, they were numb. When she arrived at the hospital, the doctors needed the signature of a family member to operate, but her parents were a three-day bus ride away. Despite the fact that they wouldn't operate, the doctors x-rayed Feliza against her will, she didn't want to be moved, she knew her opportunity to walk again depended on not being moved. "It was medical negligence, I felt my vertebra pushing against my brain." When the nurses moved her body into position on the x-ray table, Feliza felt her spine give way with excruciating pain, the worst pain she'd felt in her entire life. She knew she'd never walk again. For four years her youngest brother, who himself has a cleft palate was her personal assistant. Feliza attempted suicide by injecting herself with morphine. "I felt I would never fit in this world, the ghost pain in my legs was unbearable." When she woke up from the coma, her brother told her, "You're suffering now, what I've suffered my entire life, and I'm here doing everything I can for you." It was at that very moment, hearing her brother's words that her fighting spirit returned. Feliza on her weeding day with brother, mother and father in 2014. 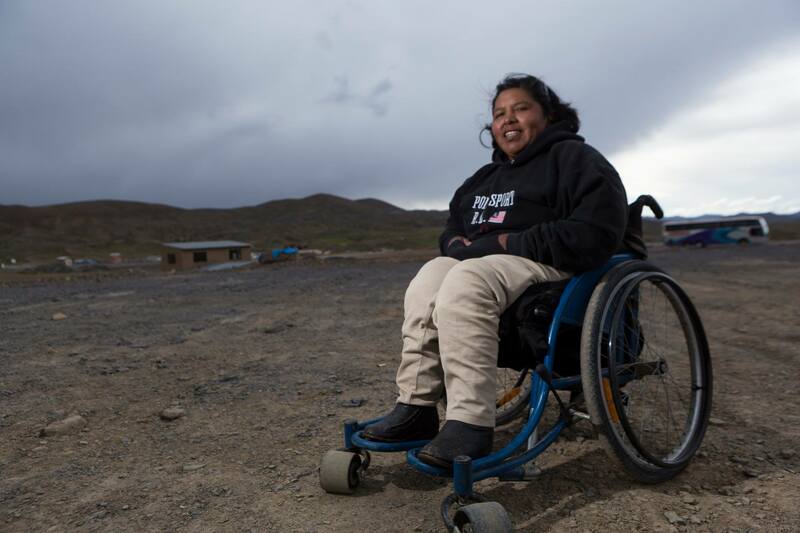 Having moved on from the accident, Feliza traveled to La Paz to speak with the people who run COBOPDI (Bolivian Confederation of People with Disabilities). She wanted to find out how she could push the government to make inclusive laws that protect people with disabilities. They told her she had to have an organization first. 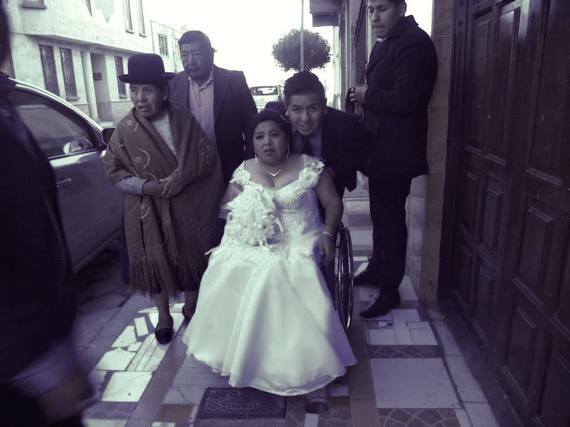 So she moved to Sucre to organize a group of people with disabilities and she became the leader. 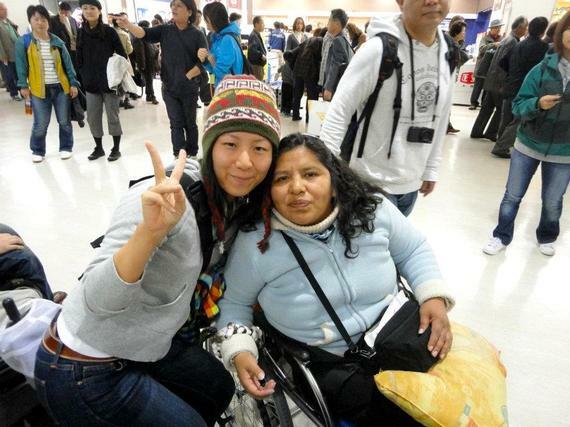 Her health deteriorated and Feliza had to go back to her parent's house in Uyuni. "I couldn't stand to be told what to do, I needed my freedom, I wanted my freedom, I wouldn't trade my freedom for anything"
Despite her tragedy, Feliza feels like a winner because she achieved her dreams; she has a master degree, she helped create a national registry of people with disabilities in Bolivia, she was employed by the British Government in the creation of inclusive policy for people with disability in the UK and she traveled to Japan becoming part of the organization Independent Life International. Feliza became an Independent Life coach and traveled to nineteen countries to facilitate workshops for people with disabilities. This year, Feliza was recognized by the ombudsman as one of the twelve leaders who contributed to the struggle for women's rights in Bolivia. In 2003, Feliza met Marcelo. Marcelo is a lawyer from Oruro who'd had polio as a child. They got married in Sucre in 2014. Feliza y Marcelo in 2013. Feliza wanted to start a tourism business for people with disability, but when she went back to her hometown and saw the conditions in which people with disability lived, she questioned her entire career. 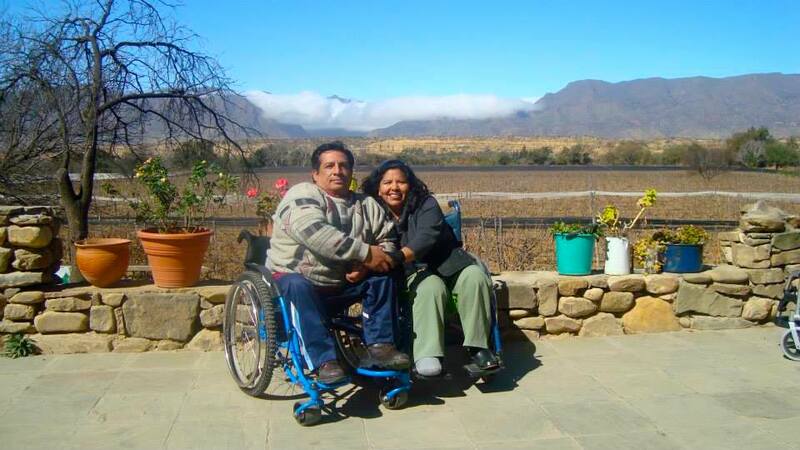 "All the programs I helped create haven't made a difference, more than 70% of people with disability in Bolivia are illiterate and 80% don't live past the age of 50. People with disabilities are invisible, we live in apartheid"
She put aside her personal ambitions and together with Marcelo, joined a national march. On March 21st, people with disabilities embarked on a grueling 300-mile trip by wheelchair through the Andes Mountains to the capital La Paz to demand equality and proper financial assistance from the Bolivian government. When they asked to talk to indigenous president Evo Morales the government answered them with repression. The police erected a two meter barricade around Plaza Murillo, were the government offices are located, guarded by 400 policeman armed with riot shields and water canons. 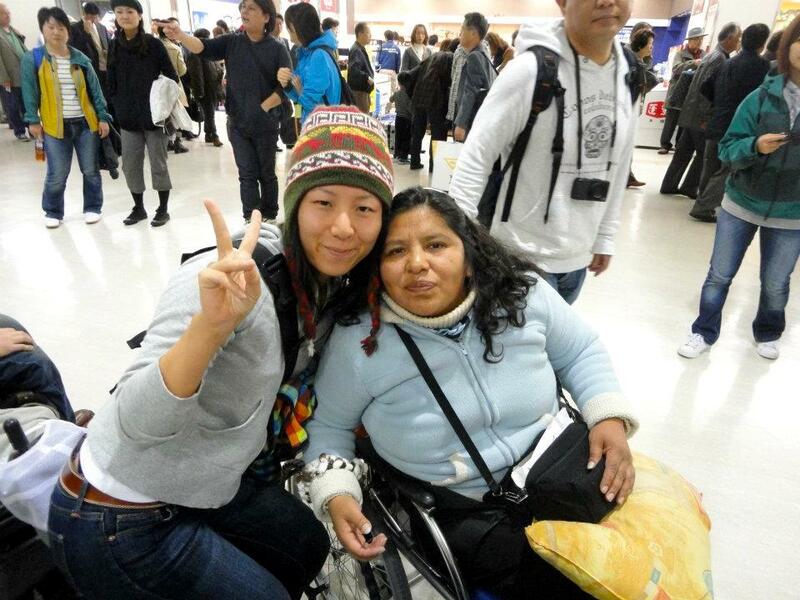 The police sprayed Feliza, Marcelo and other protestors with pepper spray, pushed them out of their wheelchairs, are constantly using techniques to intimidate them and have started a media campaign to discredit their fight. Feliza, Marcelo and all the protestors are still amped outside the barricades on the streets of La Paz. Outside her tent, Feliza looks at the twinkling lights of La Paz and tells us how much she wants to be a mother. "I started fertility treatment a few months ago, but had to put it on hold for the protest. Maybe that was my last chance, I don't know, I think I will be able to become a mother, but when all this has finished." She goes on to talk about how this is the most important fight of her life. 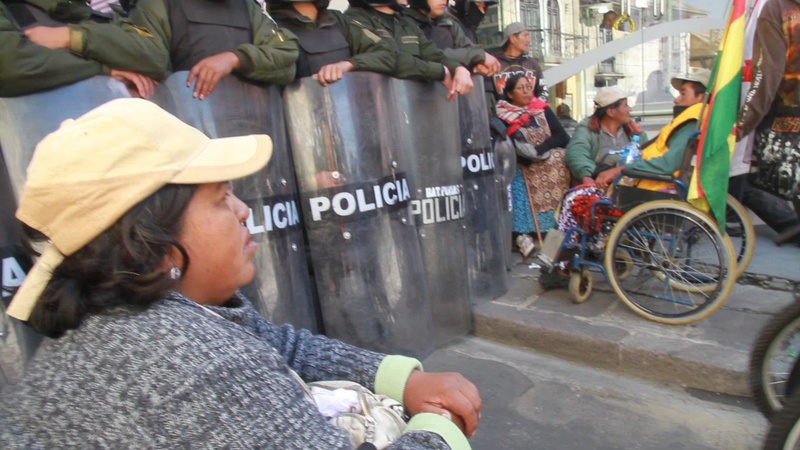 She says she will continue to the end, despite her fear of being put in prison, "I'm terrified of jail, but I know I'm fighting for justice and all of us with disabilities have the right to live with dignity in Bolivia and the benefits we're asking from the government, it's our first step."